This post is a request from aduckinherpond.com — how to keep from feeling anxious. Love that idea! So first, a little background. What is anxiety? It is a feeling of nervousness, stress, worry, and fear. These feelings can range from mild to moderate to severe and debilitating. Anxiety can be considered “normal” as in, you feel a little anxious before a test or a 5k; or it can have a detrimental effect on your daily life. I tend to think of anxiety as a reaction to fear that is out of proportion to what should be considered “normal” in a situation. Anxiety affects your body as well as your mind. Those sweaty palms and the racing heart are indicative of anxiousness. The thoughts going on in your mind when this is happening contribute to the physical symptoms and those physical symptoms, like a circle, contribute to those darn thoughts. You are caught in an anxious loop! Breathe. Take 3 big, deep breaths in, hold it, then breathe out all the way. Cut down on the caffeine in your diet. Exercise. There’s a new study out that exercise really does help (Smith, 2013). Shake it off. Animals in the wild shake themselves to get rid of excess tension (see Healing Trauma by Peter Levine, Ph.D.). Meditation can help with calming and quieting the mind. Learn how to observe your fearful thoughts without judging them; then see them floating away. Talk it over with your partner, a trusted friend or family member, or counselor. Do something different to get you out of focusing on your issues and instead focus on others or something else. Use an herbal remedy. I like Bach’s Rescue Remedy. See a naturopathic doctor. I like their way of treating patients naturally and holistically. I found out my neurochemicals were off so I was prescribed an all-natural supplement. Try hypnosis for stress or anxiety. Get a massage. Have someone rub out all the tension stored in your body. Take a bath. Light a candle, put on soothing music, put in a relaxing scent into the water, and relax. Visualize a great outcome. Close your eyes and envision yourself successful in this experience, think of something loving or someone you love and smile to anchor that loving and peaceful feeling in. Close your eyes and envision yourself as a small child and also you as an adult sitting in a chair. Have your young self come up to the chair for a loving hug. Tell her/him it is okay, you’ve got this. You’re the adult, you can handle it. They can relax now. What are some things you do when you feel anxious? What makes you feel anxious? Is it a habit? Does it keep you from living your best life? What if you were living your best life right now–does the anxiety serve a purpose because you are scared or you don’t know how to live without issues to stress about (that happens a lot to people!)? 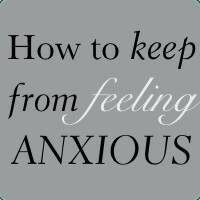 Does feeling anxious make you feel like you are more in control of your life? *I was recently appointed the Executive Director of the New York Association of Naturopathic Physicians not only because of my business background but because I am 100% aligned with their concept of treating patients holistically. I’ve been using naturopathic doctors for years now and highly recommend their way of viewing and practicing medicine. One of my goals is to educate the public on how valuable their services are and to push for legislation in the State of New York so that they can be licensed. I think understanding what anxiety is is an important step in learning how to cope with anxiety. I have a couple of kids who have some anxiety issue and I have found education to be so important, followed by some deep breathing! We also have some kids who deal with anxiety once in awhile. I think with kids’ schedules these days, sometimes it’s unavoidable! Thank you so much!!! I’ll go exercise right now and schedule a hot bath for later!